eToro REVIEW for 2016 + My Results & Update! I have been getting many requests from my blog readers to write this post, so here it is – my overview of trading on eToro over the past 12 months using my rather simple eToro Trading System! This is for the period from March 2012 – February 2013 (included) – the last 12 months. I started with a £10k deposit at the end of 2011. Currently my bank account stands at £20k+. This was achieved in the space of around 14 months. Is it a good profit to have on a passive investment? You bet it is! I’m very happy and even actually surprised that I managed to keep my head well above water at the end of the year considering I made two stupid mistakes which I will cover later in this post. When I first started trading on eToro my idea was to make 10% profit (+/-) each month. In reality that turned out to be mission impossible. I know, I know – greedy me! But over the last year spent following traders and seeing how good traders can go down the drain in a matter of just a few days, I realised that whatever I do, I won’t be able to predict such situations and un-copy in time, just before disaster strikes. A 10% monthly yield would mean a 313% yearly yield (remember, monthly results would accumulate so it’s not just 120%). My result is 80.5%, which is roughly 25% of my initial goal. If we look at my eToro trading experience from this point of view, I have failed miserably. But then again, I’m more realistic now than I was a year ago. If you ask me today, I’d say that by following my eToro trading system, you can achieve a 30%-100% yearly gain, probably 100% being a very lucky case. Even with 80% I consider myself very lucky. Realistically, 30%-60% is probably what you’re looking at. Is it good or bad ROI? Depends on how you look at it – I could probably make way more by investing that money in stock and selling on eBay, but that would require way more time and effort on my part. eToro trading is all about passive income – I really don’t spend more than 1-2 hours a week on this, just enough to monitor current traders, cancel bad ones and spot rising stars. So it’s not really comparable. You can probably compare eToro copy trading with stock trading, but in my opinion eToro carries less risk; with stocks, you would have to look out for penny stocks to get gains like these and they are very risky to deal with in the first place. To each his own, I guess, but for me the stock market looks way more risky than copying successful traders on eToro. 1) My idea of long term investment in oil failed miserably. I didn’t make any profit, worse still I had to cut the deal and accept a small loss to get out of my positions. And I’m glad I did it last summer as today, in 2013, the price of oil STILL hasn’t improved. In fact, it’s $4 LESS per barrel then when I bought it for the first time a year or so ago. So yeah, this didn’t work out very well for me, LOL. With that being said, I’m sure that in the long term, the price of oil is bound to increase, but I guess it won’t happen that soon – in few months’ time. (Now that I said that it will definitely happen, LOL). But even if it does, eToro may not be the best platform for such long trades as the small fees to carry trades over the weekend eat into your potential profits, especially if we’re talking about years of passive trading. It would probably be a better idea to buy commodities in proper commodity markets. So, no more OIL investments for me at this time. I’ll tell you! Andrew decided that he was smart enough to do trades on his own! You know – you hear bad stuff about Greece on the evening news, you know that the EUR will go down the following morning, right? As it turns out, it’s not that simple – far from it! I tried day trading as well as short-term trading (morning-evening) and failed. I couldn’t find any rules to follow. Luckily enough, I somehow managed to win back what I lost (the odds turned in my favour) but I’ll tell you – it’s pure gambling in my eyes! I’m not a financial expert and probably never will be. This didn’t stop me from doing the same thing few months after my first failure (see the second blue circle in the graph). You should learn from your mistakes, right? Absolutely! For me it did take 2 tries, but now I’m cool, totally cool. From now on, I’ll stick to copying people who know what they’re doing. That way I can manage my risks very effectively and even if 1 or 2 traders from my portfolio have a bad week, the others usually make up for it so that I’m still in profit (not that every week is profitable, of course). 1) Average Position – this means how much money a trader puts on each trade against its overall balance. For example, if a trader has a balance of $1,000 and he puts $500 down on one trade, his average position would be 50%. Now, that’s very high and risky. I usually try to stick with traders whose average position doesn’t exceed 10% and even that is only occasionally. Ideally, this figure should be below 5%. 2) Leverage – I won’t go into detail on how this works here as it would take a few paragraphs, but to cut a long story short leverage means that a trader is trading with/risking money he doesn’t have. The higher the leverage number, the more risk a trader is taking on a regular basis. 3) Weekly Drawdown – a new and very helpful indicator. This basically shows the MAX losses a trader has made over a chosen time period. It also shows unrealised trades, which is great as this allows us to filter out “good-looking” traders who have long-standing negative trades open that they don’t want to close so as to not ruin profit numbers. When using this filter for low risk trades set it to 20%-25% and below. 4) Winning Weeks – this filter is not very objective as winning weeks really doesn’t mean anything. Some traders may have a very low rate, but when they win they win big (long trades) while others may win 9 out of 10 weeks but when they lose, they lose everything they made during those 9 profitable weeks. So this really is irrelevant. 5) Win Ratio – similarly to the Winning Weeks filter – it’s not very objective, but obviously if you’re looking for low risk traders, this number should be quite high, at least 50%+. 6) Gain – or profit made against the bank. This is obviously a very important filter as it shows exactly how much money a trader has made over a given period of time. 7) Minimum Number of Trades – this is a good one. 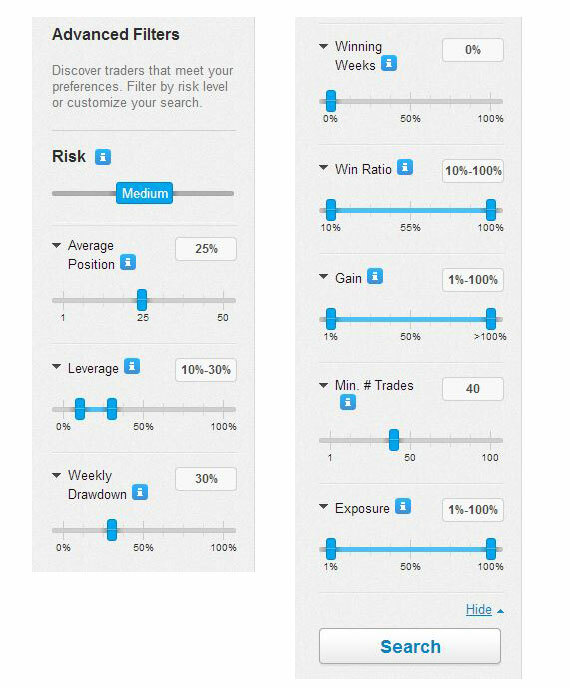 By using this you can filter out all those lucky traders who have impressive gain figures, but who have only made a few trades. We want tried and tested traders who make at least a few dozen trades per year (if the number of trades is that low, the win through rate should be very, very high). 8) Exposure – another good indicator for spotting low risk traders as they’ll never risk their entire bank in all of their open trades (unless several open positions are open against each other, e.g. when one increases, the other decreases). Still, this number shouldn’t be more than 50% in most cases. These filters really help me to find good traders. Even after using filters, remember that you want to check each trader manually to see past trades and open positions, the number of copiers, portfolio allocation and most importantly – graphs/trends for last 6 and 12 months of trading results. From these graphs you can instantly spot a good trader with steady growth over time and a low number of high risk trades. I hope this update is of some value to you and gives you a better insight into what’s going on with my eToro trading activities. Here’s what I plan to do now – I’ll withdraw the £10k I made in profit and leave everything else in the system. This way I simply cut off any risks associated with this venture – I have made back my initial investment and I will now leave the profit to make more money for me. No risk of losing for me from now on. You could say – why, Andrew? Leave all the money in the account so you can double it this year and make some real money, etc. etc. Yeah, right! It could work out like that, but then again, it might not – I can’t know for sure. Maybe I’ll lose all the money this year. I simply don’t know because Forex trading is not predictable. That’s why I am choosing to take the safest path, sleep well at night and only risk the money I earned last year. As I explained in my original blog post, I’m not really a risk taker – at least not on this kind of scale. I would never put my life savings into eToro, the stock market or similar risky activities. NEVER! I simply wouldn’t be able to sleep at night and would be stressed out all the time. Prices go down the same way they go up – you never know what you’ll see in your account each day – and it’s very stressful! That is, if you’re risking money you can’t afford to lose – much like when you play poker for stakes you’re not comfortable losing. I would rather invest that larger sum of money in stock, because I know for sure that in 99% of cases I’ll be able to sell it. In the worst case scenario, I sell it at cost price. Same goes for property investment – in today’s climate, when prices are down but rents are relatively high, investing in a good property is a much safer long-term investment. Sure, with properties you can’t make an 80% gain in one year, BUT the risks are much smaller too. To sum up – it has been a really great, fun experience trading on eToro and it turned out to be quite profitable, too! I would never put £100k or £200k into this system, but as a side investment it has worked out very well for me so far. Whether or not it’s suitable for you is your decision to make! It can’t hurt to try, right? Even if you start with just a few hundred pounds, it is a great learning experience and can bring in some extra cash to spend on Xmas gifts at the end of the year. Good Luck with your trading activities! Check out my eToro 2015 UPDATE HERE! All trading involves risk. Only risk capital you’re prepared to lose. Past performance does not guarantee future results. This post is for educational purposes and should not be considered as investment advice. I’ve spent my last 2 days reading your posts about eBay and ended up reading these posts about eToro. Far as I could understood is that your strategy is to follow disciplined and steady traders with longer trade history, with active trades and no big risks. I was thinking to start by looking for good traders for a while and also to follow few of them (up to 5) and copy them in practice mode (1 month let’s say) then (if everything goes right) I am thinking to add £1000 and to start following the most disciplined ones. Do you think it is a good way to start as a beginner? Yes, you can def. do that. Only thing, when you use play money, you have to be careful with your mindset as usually people act differently when real money is involved. It’s like playing poker with “free money” – you take way more chances, risks etc. compared to a game where real money is involved. So my advice actually is to start with real money, be it a very small budget, but then at least you know that you’ll be 100% concentrated on what you’re doing. My 2015 eToro Investment Update! My eToro 2015 update will be published in January, so stay tuned! Just been reading about eToro and very tempted to participate! Your articles are very informative. Are you close to posting your 2014 update? Yes, it will probably be 2014/2015 mega guide. Great article, these types of articles really inspire me! May i ask do you invest in properties also? i know you mention it above and this is an area that really interests me also. Yes. In fact most of my investments are made in properties (to rent) as in my opinion it’s the safest long term investment approach out there. I have dedicated my time almost the entire day to read more about investing at etoro. I actually didn’t know the copy trader thing. I think this is an intuitive idea. If one can follow those traders who are showing consistent performance in the past six months… then it can help. In addition spreading the risks on different traders is also nice since one will reduce chances of losing all the bank from one trader. The last time i traded on forex, it was on a broker and i lost my $100 within the first one hour of trading (I was doing the trading all by myself). From that, it gave it a break, but after reading your information, it has given me some insight on how i can trade using the copy trader and not risk like i did last time. If you were planning on doing another update soon I would love to see you highlight your recommended search parameters when looking for low risk currency traders to copy. Especially seeing as the search function and available filters have changed substantially since your last update. Other than that, keep you the good work! Thanks for the suggestion Todd! I know, I know – it’s coming soon! Thanks for the great post. Will you be doing an update soon? Yes, I will. I got side tracked by other projects but I plan on doing a 2014 eToro update in July. thanks for the blog. great write. just looking for one question, on my account i don’t see the advance filter that u are talking about. i just have the popular search.not sure why. i have recently registered for a real account with 50usd to learn. Unfortunately eToro took advanced filters down recently (not sure why they did it). So we can’t use them at the moment. Wondering if you have had any issues with being out of Sycn with the Guru? As in, the Guru adds extra funds into his/her account extends his TP or SL, and then your account(copy trader) did not have enough funds to cover this, perhaps due to the 20% rule? What have you done to cover come this? Brilliant couple of blogs about etoro. I am just setting out and just wanted to know if your gains were in fact 100% tax free in the uk. There is very little information on the net on this. I did find one page that said it is definitely considered under income tax. http://www.justanswer.com/finance/7zb88-backgroundetoro-http-en-wikipedia-org-wiki-etoro.html. But I am still unclear as to if it is tax free, income tax liable or capital gains tax liable. Could you clear this up for me? From what I know, CFD trading (which is eToro) is classed as gambling, hence it’s tax free. But it is indeed difficult to find precise information about this online. But if I remember correctly, I got this information from eToro directly, and they should be right? Don’t count on me for this though and if in doubt, seek professional advice from an accountant. thanks a lot for these two very well-written and helpful guides! I read them in the last weeks more once and then decided to adapt your strategy. I’m planning to do a post on eToro in March/April so stay tuned! Great posts and informative, might sound silly but when you follow a trader and it starts making the same moves so to say when that copied trader sells do you also sell or do you do that manually yourself when you want to? When you FOLLOW trader, you only get notified on what trades they do. Your account won’t copy those trades. To start copying a trader, you want to click on COPY TRADER – when you do this, all trades will be copied and executed in your account too. eToro social gurus are not great. Their risk and reward does make no sense at all. Their risk is about -200 to 500+ pips while reward is 5 to 200+ pips. It is not a professional way to trade. If you trade with 500pip risk, you’ll never win or lose. Almost all social gurus add money to their open positions to extend stoploss. It’s ridiculous. One of social gurus named “Dellos” is not a trader but gambler. Look how many open positions he has. He has almost hundreds of open positions that are way way way far away from profit. It’s not a big problem for him because he has 8000 copiers which means he gets paid monthly to trade. He doesn’t win or lose. If you want to make money off trading, you should do it by yourself or find a professional trader to invest. Many Thanks for your comment and advice. 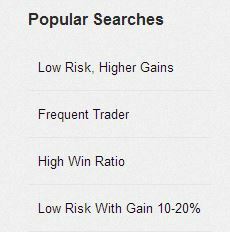 It’s true, there are many gamblers on eToro and even ones that are often featured as top traders to follow. That’s why I carefully analyse a trader before start copying it AND open trades is almost my number #1 filter right after profit/loss etc. If there are many trades opened for months or even years, I would never copy such a trader. And I can agree that it’s probably best to become a professional trader and do it all yourself but for many people, that’s just not an option and eToro in my opinion provides a safe alternative – introduction to trading world for masses, which has never been possible before. Great article, very informative. I was just wondering wether you had any experiences with making great losses when copying traders? I picked some reasonably safe traders to copy around 3 months ago, 15 of them to be precise, but in the last two days I have lost all my profit and my drawdown is now -50%. 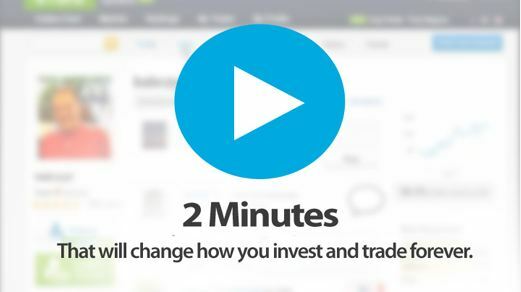 Did you have a similar experience at any point during your time on etoro? I have had short term loses too of course but nothing like -50%. Did you copy only safe, low risk traders? I stay away from high risk traders, traders with long opened positions and traders who portfolio is heavily based on copying others. Thanks for your reply, its very much appreciated. Yes most of my traders were low-medium risk with the odd high risk. However the high risk traders, I’m sure your aware of Unser & Dellos, are doing ok in comparison to some of the medium traders at the moment. I have a feeling that it is a ‘strangely volatile’ market; with the USD shutdown a little while ago and some of the JPY currencies reaching all time highs/lows at the moment due to the BOJ depreciation. I think, but I’m not sure, that this caught some of them off guard. Even in my practice account which I have used many more and very different high & low risk traders to work up to $19000 is now a mere $13000, also with about -40% drawdown. My real account wasn’t that far behind this and if I ’pack up and go’ now, I lose half my money which is not a good feeling as I’m sure you can imagine. Its very difficult to get it right though, as some of the lower risk traders have the longest open trades. Santosh and Malsolo have years old trades and make just a few % a year with very large drawdown at some points. When the USD shutdown happened other safe traders such as Caraj, Roby26 & Alexfrank all had trades go sour and shut up shop for 2 months with some copiers having trades run into SL; meaning that they had to pump more money into the copy system. But many people on etoro are talking of problems and losses due to peculiarities in the market at the moment. I just wanted to know whether these ‘black swans’ happened while you were trading on etoro? Yes, I have heard about Zulu trade but haven’t tried it out. Not sure what that platform can offer me if there are far more traders on eToro currently. That could change in future though. I wanted to give a try to this system but after having opened an account I discovered that all those nice filters are now changed in just 1 risk selector and a simple list of popular searches, not very useful to build an effective search strategy. Do you confirm this unfavorable change or it’s me not looking in the right section? Yes, this is a shame and I really hope they bring back manual filters! Not sure why they did this change but it’s no good at all. Probably because they find more socially interesting to give a chance to most of the customers (randomly chosen?) to be copied, or because their broker may earn betting against average poor performers, sadly a behaviour of many brokers. In this case can I ask you how you keep using this platform profitably? Now it’s really hard to find even one good profile to copy.. Any tips? I haven’t really started looking into this new system as it’s live only for a week or so. At one point there was no filters at all so maybe they’re just re-designing the look of it and give manual filters back. I’ve seen plenty of this filters at Zulu Trade, another broker/platform which lets you automatically copy the trades from other traders within the same social network. It looks good for your strategy, have you ever tryied there? It might be an alternative..
Andrew, a great pair of articles you have written regarding eToro, I would strongly recommend any new copier to listen to your advice. Especially when it comes to those seemingly never ending lists of open trades propping up the apparently unblemished and popular gurus. I have a question though. I am currently copying ten traders (10% each), who have nice consistent stats, low average trade sizes, few or no stale open trades. They are lovely. Three however, have not traded for over two weeks now. I am of two minds on this matter, while I am irritated by their inaction and reduced returns due to locked up equity, I also understand that their behaviour is risk averse in response to market uncertainty (at time of writing, US debt crisis). The temptation is to uncopy them, and distribute equity to my other traders who continue to trade, however I feel that perhaps their ‘not trading’ is in fact a very reasonable strategy trading right now, and their hesitance helps to more effectively distribute risk in my portfolio. What would you do, if three of your traders halted their trading for three weeks or perhaps more? Thanks for stopping by and sharing your insights on eToro trading! You’re absolutely right! The fact that a trader is in-active right now makes sense to me (I see that happening in my portfolio too). And I wouldn’t un-copy a good trader only because he hasn’t made a trade in a week or two. Often people take breaks, holidays too when they stop trading and it’s not a reason to un-copy them if their results are good. I will just wait until the US debt crisis end and then see what happens. Thanks for all the useful information and advice, nice to see a helpful & ethical report on a financial product for a change! Great to hear that! Glad I can help by sharing my experience. Hi Andrew. Thanks for your great post! Very helpful! I do have one question about the etoro Advanced Filter to find good traders. I can’t seem to “enable” the advanced filter? I only see one slider for Risk but no other sliders. What do I need to do to get the other sliders too? Or is it maybe a flow in my internet browser (which one do you use?)? It could be a temporary glitch as I can’t see Advanced Filters myself for now. 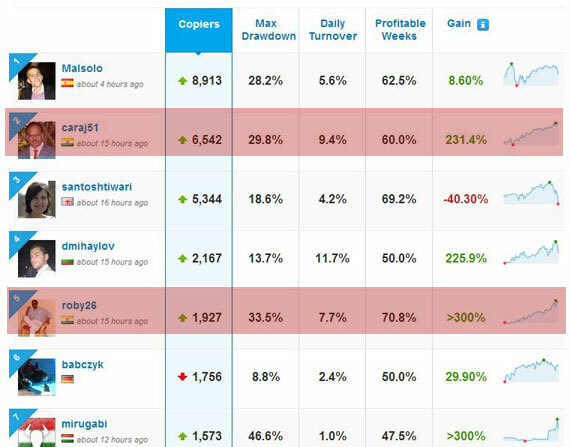 are u still making money with Etoro via its CopyTrader? Have no plans on quitting. I really cant wait to see u update your eToro trading strategy…Really ! Hopefully it would come very soon~! Thanks in advance~! No, you can’t lose more than what you put into your account and/or win. In your example, max you could lose at that stage would be £1200, not a penny more. Hi bro, any charge if we make withdrawal from Etoro into our paypal account ? Yes, there’s a $10 fee involved with any withdrawal. Thx bro, do u mean $10 is charged by Etoro ? So if we received $100 from Etoro to Paypal, what actual amount can we get in the Paypal account ? Yes, $10 is charged by eToro so you would receive $90 in your PayPal. They use mass pay I believe so you don’t pay any receiving charges with PayPal. I loved ur system but how can I trust Etoro? And I found many people says its not safe. In my opinion, YES, you can def. trust eToro! At least, not less than any other such companies. eToro is now FCA regulated company now in the UK and that means their finances and operations are constantly monitored by authorities. 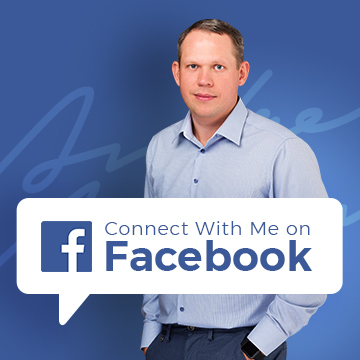 You won’t have any problems with withdrawals – I have done it many times. The negative feedback on this is that it takes sometimes 3-4 days to receive money but I don’t think that’s a big problem. Lastly, you’ll find negative comments on almost any company online! Don’t take everything for granted as there are often competitors who try to make bad publicity. There are now more than 4 million eToro users and few negative comments really doesn’t mean that much. At least I’m 100% satisfied with how eToro works. Good review and thoughts about eToro and your strategy. And thanks for your effort to provide us with this information. I have on my own hand traded stocks and forex profitably and actually found a strategy that works very good for myself. It’s a hybrid of technical analysis, sentiment analysis and price action. It handles risk very reasonable too. The problem you see – is that I started law school so I don’t have the time to carry out trades myself. Since I have a small investment going on together with my family I have thought of eToro. And as of my demo account I performed an incredible 130% return within 6 mths. So we are about to start investing with eToro with other autotraded services too like iron condors. I am happy that someone shares the very same reflections according the compounding effect generated from profitable trades when one cannot trade self. So I would like to hear if I could be informed with your eToro name? – And I would be glad if you could write me back on the attached email-adress. I could. I can also help you. My initial thought was to generate a good retirement although I am only 21. But it’s good to start in a early age – right?. Thanks for stopping by and sharing your experience with trading. 130% within 6 months sounds very good to me! Over time it will probably get lower but 100%+ yearly returns is totally achievable. Where else can you make such massive return on investment with relatively small risk? (if doing proper portfolio management). Imagine what kind of bank you can grow over 5, 10 or 15 years starting with just $1000 right now? Go for it and stick with basics, this way there’s very little chance of losing your bank. Well you be making a update since they change the way to look up traders would love to see your gains. Are you still in etoro? Yes, I’m still doing eToro. I will probably do a bigger update early next year. Thank you for all the information. Not sure if I missed it or not, but what is your Etoro Alias? I’d like to look closer at your stats and and your choice of guru’s. I also use Etoro as my passive investment and it would be interesting to compare with your setup! Could you not post a link to your etoro trading profile please? You keep saying that you’ve posted that above but i’ve looked through everything and didn’t find it. Please could you post it again? Great post regarding trading on eToro, my question to you Andrew is, l have around £1000.00 to invest,in your opinion which is the better option. 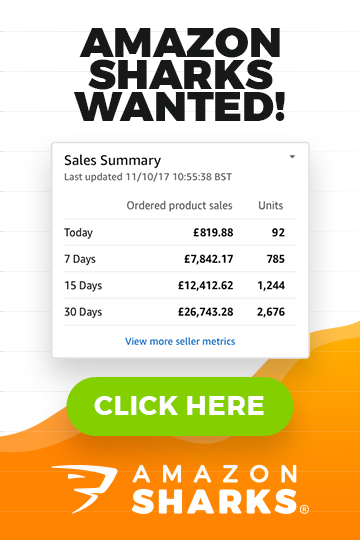 2) Invest £1000.00 in an eCommerce site such as ebay. I know this may be a million dollar question, but would really appreciate your thoughts. 1) What are your long term goals? 2) How much time you can spend on this on a daily basis? 3) Are yo prepared to take the risks associated with eToro trading? If you want to build a real BUSINESS, go with eCommerce/eBay. If you want to put your money into a passive investment scheme, use eToro but be prepared for risks and that rewards will be seen only long term. By that I mean that – as we’re making relatively small profit (% wise) on eToro, if following low risk investors, small initial capital can’t give you a full time income. It will take many years until you turn those £1000 into a decent sized investment portfolio to make a full-time income. I did just to illustrate examples of good/suitable trading history/trends you should look for – steady growth over time without big ups and downs. Yes, those two traders are definitely worth copying. Worth noting for others reading this that both the traders marked in red trade from the same trading room so trades will be very similar. Thank you for your previous reply further up. I think unless the person has had plenty of practice to trade, the Copy Trader idea seems best route even if you had +5 people copied just to spread risk.Are there any disadvantages in spreading funds thinly between many traders? I saw a profile of a guy from Kenya (somewhere like that) and he has a crazy “gains” history record. He has lost trades, but his gains looked good. Don’t think he does low risk trades, but I could be wrong. NO, there are no dis-advantages to copy 5 or even 10 traders. I personally have +/- 10 traders in my portfolio at all times to spread the risk. Can’t comment on that guy from Kenya though. I’m only copying low risk traders (with occasional medium risk trader if he’s doing something phenomenal). It is me again (from before). I’ve joined the website since reading your thoughts on it. I did fall for temptation and perform 3 manual trades (2 minor profit and 1 minor loss). I fell foul on the “copy open trades” option which is always ticked automatically when I go to copy traders. I copied one trader quickly and he had 4 open trades which were being carried over the weekend. Not seeing the error until it was too late, I had 4 open trades I did not want and they were all for the same currency. I then was even more unfortunate as the guy closed them all (in profit for him), but still in the red for me (only just though). I put in £200 and the trades were only a few lost pennies luckily. Have now just recovered above the 0% on level, so I’m happy. Yes, I NEVER go with current trades when start copying new trader, NEVER! This is actually a new feature eToro introduced very recently and I still can’t figure out why they have it checked as default when you want to copy someone. Anyway, good luck with trading Gary! I understand your reasons. Thank you for your reply anyway. what a great post! Thanks for sharing your experiences with us. How was your experience of withdrawing money from your etoro account? I hope it was as easy as paying in or do they make it harder to get it out? Withdrawals are pretty straightforward and automated – first time you withdraw money you have to verify your identity though (usual scanned ID + bill for proof of address) but after that, all is automated and money is in your account in 3-5 days time. would you consider making your trades ( or copied trades ) available for others to copy? I would definitely be interested as I like your system. I am aware there is always some degree of risk but I am ok with that. As for the subscription service – I have thought about it to be honest BUT I can’t see how it could work out. I’m not a professional trader so for me giving out advice etc. would simply be un-ethical. I have said it several times that this is more like a hobby for me and I want it to stay that way. The World wouldn’t end for me if I lose the money invested in this project but I could never sleep well knowing other people’s money is on the line…. Maybe in few years time, when I will have a proven track record on eToro, I will change my mind. In response to the point above, would you be willing to share your eToro profile name with us so that we can see who you are copying? I have been formulating my own method for copying people (some low, some medium, and some high risk traders), but would be interested to be able to compare who I am copying with you. Found your site via wholesale forums and stumbled upon your eToro pages by chance this morning. I’m tempted to try the practice account. When you performed trades in the past on eToro have you ever found it slow to process? I’m just wondering what the ‘technical’ experience was like, whether things went smoothly or not. Saw one or two videos online of people complaining about this (one was dated 2011). Although I was wondering if that could just be an issue with the individual’s computer. I have not had any issues with the speed of eToro as I’m not day trading. When you copy others or make long term trades (oil, gold, stocks), the speed is not an issue at all. 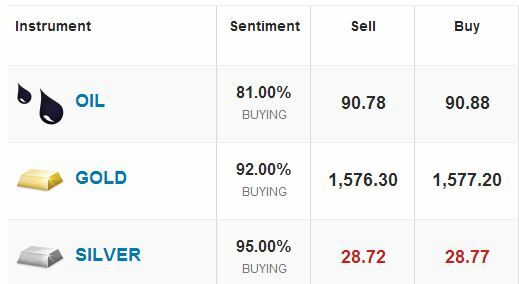 With day trading, every second and mili second is important but as I said, I have no experience in doing such trades on eToro. My quickest trades lasted several hours. Which traders are, according to you? the bad ones? How would they behave? I mean, we all use analysis and filtering to find the best traders on eToro. Then, in a few weeks, those good traders take your account down into red. What would one do – keep them, or drop them? How does one tell the trader is messing up? Yes, that’s the hardest part – knowing when to drop a trader. That’s why it’s crucial to diversify your risks by investing in as many traders as you can (I try to stick with 8-10). As for signals on when to drop a trader – there are no systems I use for this, it’s just manual observation. I don’t drop trader after one or two negative weeks but sometimes that’s enough to push the hold button and stop following future trades. Ah i had indeed been looking forward to this update. Great to hear how you have done with it Andy. Like you i have noticed its best if i don’t trade myself, and leave it to the people who know what they are doing. It’s always tempting to have a go yourself but after a few bad trades i soon learnt to leave it to them. Glad I’m not alone on this Liam! Thanks for your comment & good luck with trading! I will be doing an update on my eToro journey in near future so stay tuned. There’s also a special guru page here: http://www.etoro.com/guru/meet-the-gurus which displays the total income for each guru. If they have earned >$30k they probably know what they’re doing so it’s worth taking a closer look at their profile. So, in conjuction with other checks as described in your post Andrew, we can locate the best traders. Personally, I’m willing to pay for a special service that will send once a week an email to my account regarding “who to follow” traders. People trust you, so if you say follow these traders, they will do so. Thanks Andrew for your honesty. I really appreciate it. Congrats, Andrew! Thanks for this post! It’s good to be a conservative player in Forex, I guess. No need to see your fortune disappear overnight. Thanks so much! I’m glad I waited for this post before starting. I’ll start out small and see what happens!